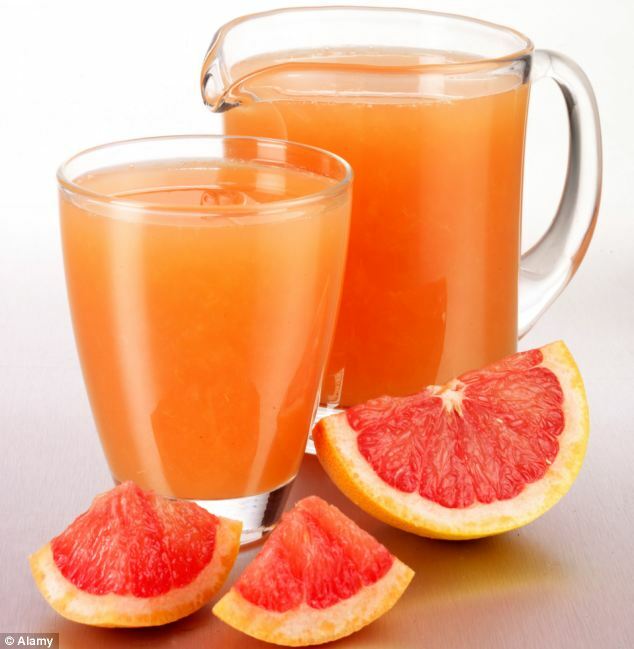 Tart and tangy with an underlying sweetness, grapefruit has a juiciness that rivals that of the ever popular orange and sparkles with many of the same health promoting benefits. 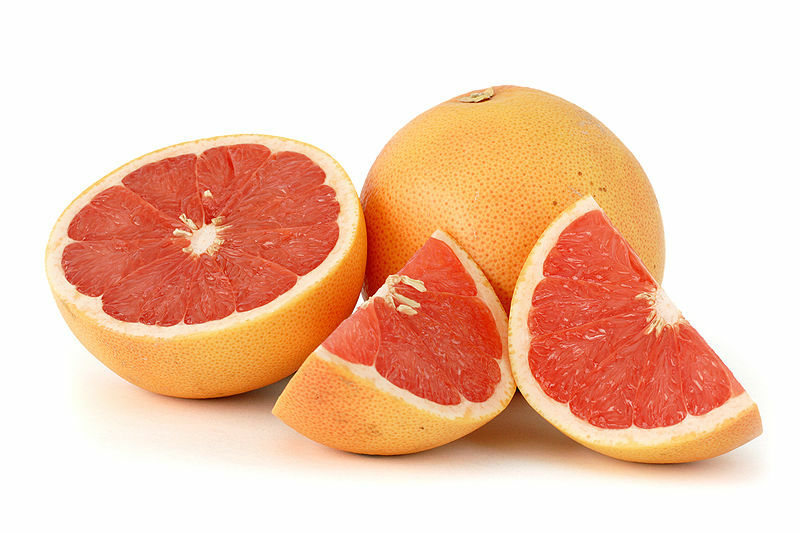 Grapefruits are in season and at their best from winter through early spring. This is a photo of our grapefruit tree taken in November last year. It’s winter now and I know my grapefruit tree is bearing fruits. The first fruit would be ripe and ready to eat now. The tree will be full of fruits for at least five months till December. We had enjoyed our grapefruit for the last four years but this year, our grapefruit tree will be bearing fruit for its new house owner. We miss our grapefruit tree and the fruits it bear, hence I post today this article in remembrance of our tree and sharing the joy of what I did with its fruits, besides giving away bags full to friends. Grapefruit juice is so thirst quenching. Great for breakfast and makes a nice thirst quencher after a dog walk. 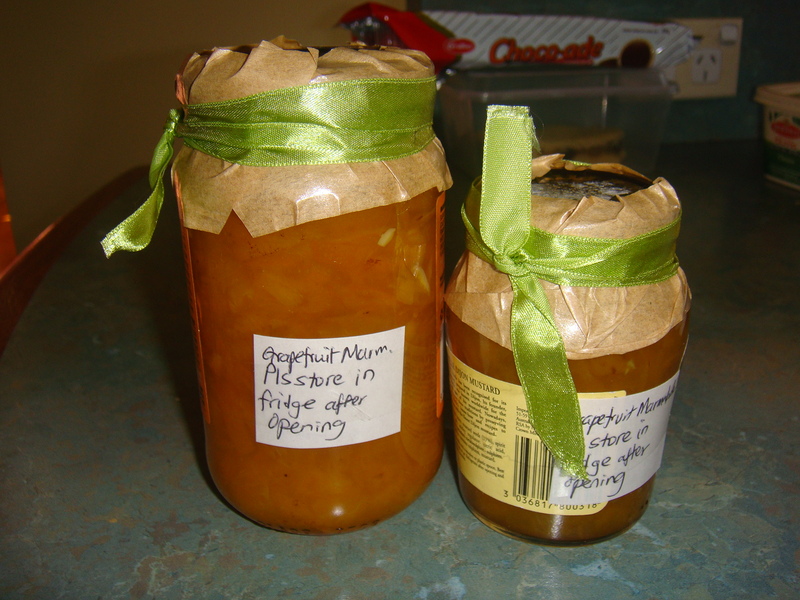 My favourite use of our grapefruit was to make grapefruit marmalade and chilli grapefruit chutney. The process takes around 30 minutes to make and I prefer using the microwave recipe rather than the traditional method of soaking overnight and spending hours boiling on the stove. 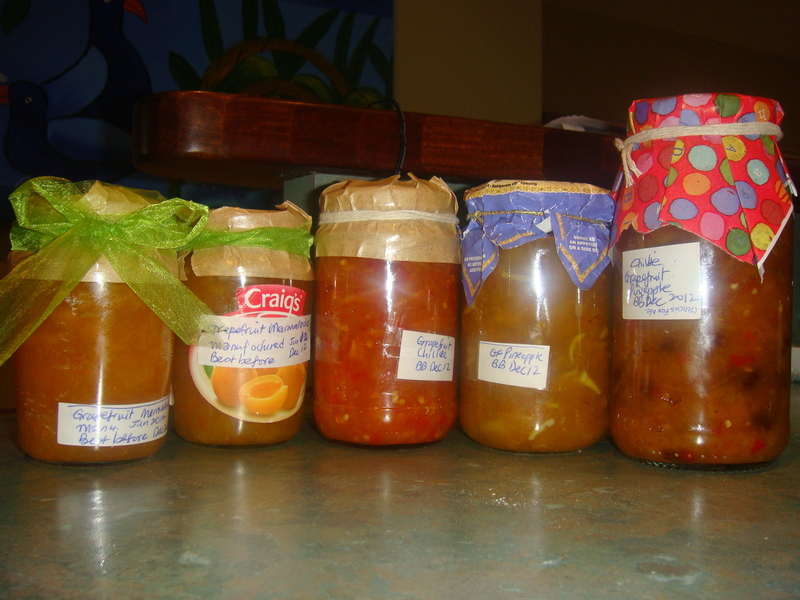 The above picture were my last batch of homemade grapefruit marmalade and chutney. I still have a few jars of marmalade left in my pantry (does not need refrigeration unless opened). They have lasted at least six months and should be able to last a year if the jars were well sterilized and stored in a cool place. 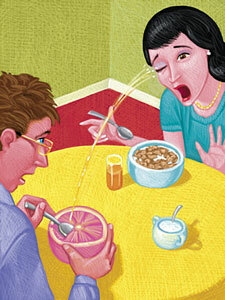 I had some for breakfast this morning (see above picture). Does the photo do justice to the freshness of the grapefruit marmalade? Sharing below ‘Must try’ recipe. 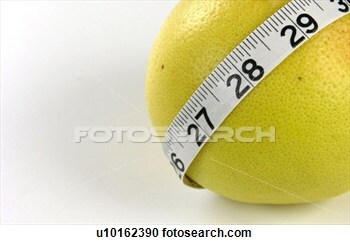 Use a peeler to peel the thin, yellow, outer layer (zest) from the grapefruits, orange and lemon. Slice the zest into thin strips and put it aside. Remove seeds and white pith from the grapefruits. Make sure you do a good job getting rid of the white pith, because it tastes bitter. Chop the juicy bits of the fruits finely and put them to a large, microwave-safe bowl along with the zest. Add an equal amount of sugar, i.e. 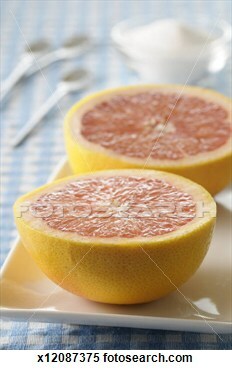 one cup sugar for each cup of chopped grapefruit. Add water, just enough to cover (level) all the fruits. Microwave on high for 25 minutes, uncovered, stirring every few minutes. You will see the color change to a beautiful deep orange at about the 10 minute mark. To test whether marmalade has reached setting point, smear a little bit onto a cold plate and let it cool to test the consistency. If it’s not thick enough yet, then microwave it for another 5 to 10 minutes or so. 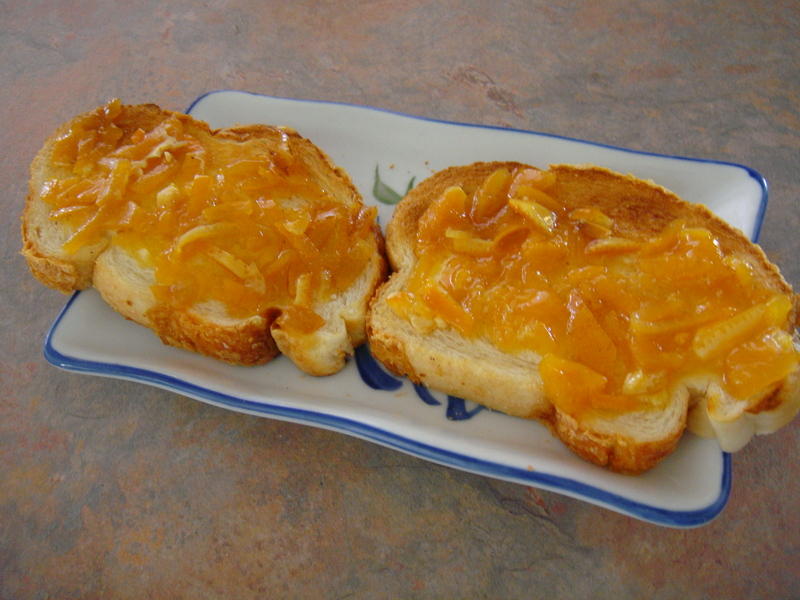 When marmalade is finished, ladle it into the jars, up to 1/2 inch from the top. Put lids on jars, and turn jars upside-down for 5 minutes to seal and sterilise the lids. Then turn upright and let cool. Dress it up nicely with some coloured fabric/tissue and a ribbon if you wish to present them as homemade gifts to friends. Recipe for grapefruit chilli chutney is almost similar. Added ingredients are chilli and raisins. Enjoy !!! This entry was posted in Food (Makanan) and tagged chutney, grapefruit, marmalade by Little Borneo Girl. Bookmark the permalink. hello!! 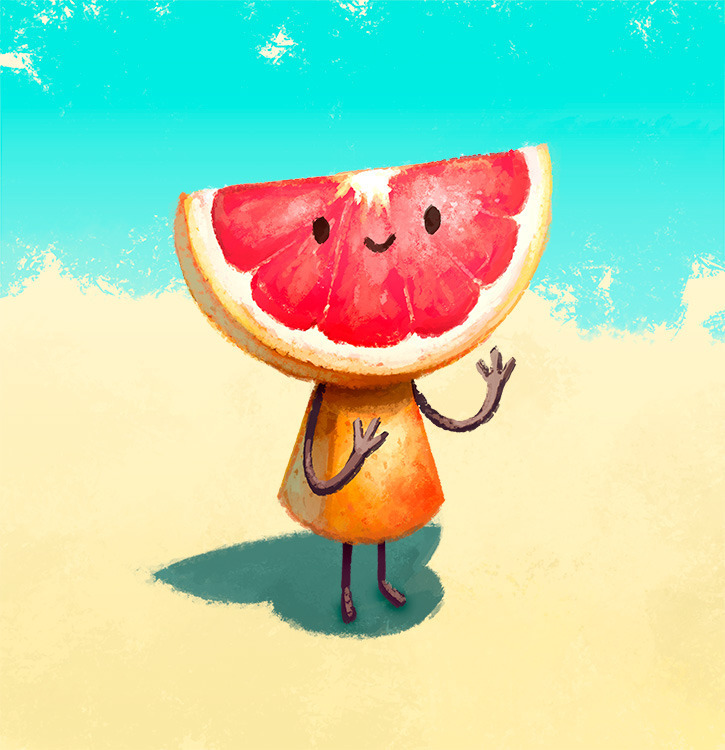 i am amazed you have your own grapefruit tree!! and the jam must taste super good!! I enjoyed this today.